This popular japanese paper tape comes in a huge variety of colours and patterns and is a really clever way of making otherwise plain packaging look amazing on a budget. If you have nice handwriting, make this a feature of your presentation. A handwritten message gives your product pure handmade credential and can leave a lasting impression with your customers, especially if you include a personalised message with their name. You don't even need expensive calligraphy pens to get a great effect as there are a number of low cost gel pens on the market that have a great writing style: check out The Pen Addict for reviews of popular pens. There are a number of companies online that will produce a stamp of your own design for much less than you would expect. You can use these for anything where you want to create an extra bit of brand awareness: on envelopes, as part of your packaging (e.g. stamping tissue paper in a pattern) and for creating low-fi letterheads. It's pure versatility means that a stamp can be a really good investment: non self-inking versions can be used again and again, so after a small initial outlay all you need to factor in is the cost of replacement ink. With your business name and logo can be really cost effective and add a touch of professionalism to your package. This option is great if you need to turn around packages quite quickly as stickers can be used to wrap and to brand all at the same time. In particular, natural / brown coloured Kraft paper is great for showcasing eco-friendly products like soaps and beauty products. Using this style of packaging with colourful products can be really spectacular as it makes the colors pop and lets the product take centre stage. Team this style with a custom stamp print and garden twine for a really great handmade-chic look. This is a great low cost packaging option as it is extremely lightweight - where postage is charged by weight this can add up in considerable savings. You can make your tissue paper a little more interesting by stamping interesting patterns or using a couple of different colours together in interesting ways. Be smart with your scraps as they can also be a source of cheap packaging materials: if you make fabric items, utilising some of your remnant fabric for bags or wrap can be a really interesting way of packaging your items. For inspiration, the japanese Furoshiki method is worth looking into: this was a technique used by japanese merchants to wrap their wares using cloth. Just be wary of your additional labor time here, if you spend too long on making packaging then it may wipe out any savings made on materials. 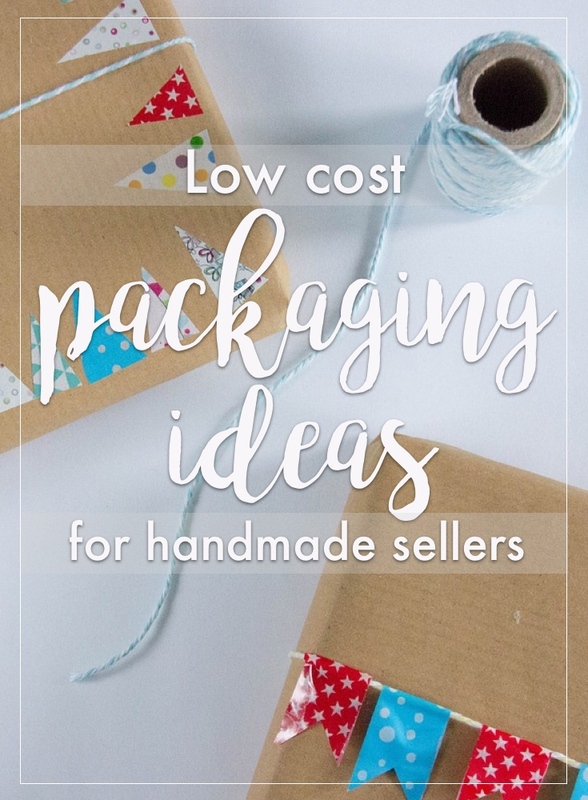 Alternatives to ribbon like garden twine, raffia, handmade pom-poms and even colorful yarn can be an interesting way to put a low cost finishing touch to your packaging. Coupled with the previous tip, finding ways of utilising your remnants creatively for embellishments can really help save money on packaging. Make sure your hands are clean when packaging up your items: random stains and thumbprints can undo all of your good work, even if you have spent a fortune on fancy cards and wrapping! If you are wrapping up your items, practice so that your wrapping technique is tidy and looks polished. Keep to a simple consistent color scheme as much as possible: this makes your packaging and branding look cohesive and professional. If your items are in any way breakable, ensure above all else that your packaging solution will ensure that your customer receives your product intact. Although not as aesthetically pleasing as other options, bubblewrap and heavy duty cardboard are the best options for this. How do I download a report of my sales and orders from Etsy?